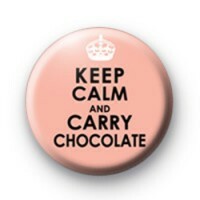 We love making this badge in particular because we love the message, Keep Calm and Carry Chocolate. I think we should all do that! I love dark chocolate and always have a stash in my handbag. We all love chocolate and this badge would be perfect for anyone you know that is a chocoholic or a bit of a chocolate hoarder.